Aggiornamento (Italian pronunciation: [addʒornaˈmento], plural: aggiornamenti), "bringing up to date", was one of the key words used during the Second Vatican Council both by bishops and the clergy attending the sessions, and by the media and Vaticanologists covering it. It was used to mean throwing open the doors of the Church in a desire to dialogue with the outside world. It was the name given to the pontifical program of John XXIII in a speech he gave on January 25, 1959. The Bologna School is a historical school of ecclesiastical history, specializing in the history of the Second Vatican Council, and largely supportive of the so-called hermeneutic of rupture, creating a pre-Conciliar and post-Conciliar period. The leading minds of this historical school have been Alberto Melloni and Giuseppe Alberigo. The Central Preparatory Commission was the body that co-ordinated the preparation of the schemas for the Second Vatican Council. It was established by Pope John XXIII on June 5, 1960. It had 120 members, including cardinals and bishops, amongst them was Cardinal Giovanni Battista Montini (the future Pope Paul VI), Archbishop Marcel Lefebvre, and Cardinal Ottaviani who chaired the Commission. CD describes how bishops exercise their office at three levels: in the universal church (chapter one), in their own "particular church" or diocese (chapter two), and at the regional or national level (chapter three). The Coetus Internationalis Patrum (Latin: International Group of Fathers) was the most important and influential interest group of the "conservative" or "traditionalist" minority at the Second Vatican Council. A council is a group of people who come together to consult, deliberate, or make decisions. A council may function as a legislature, especially at a town, city or county/shire level, but most legislative bodies at the state or national level are not considered councils. At such levels, there may be no separate executive branch, and the council may effectively represent the entire government. A board of directors might also be denoted as a council. A committee might also be denoted as a council, though a committee is generally a subordinate body composed of members of a larger body, while a council may not be. Because many schools have a student council, the council is the form of governance with which many people are likely to have their first experience as electors or participants. A member of a council may be referred to as a councillor or councilperson, or by the gender-specific titles of councilman and councilwoman. Gaudet Mater Ecclesia (Latin for "Mother Church Rejoices") is the opening declaration of the Second Vatican Council. Pope John opened the Council on October 11, 1962, in a public session before the Council Fathers as well as representatives of 86 governments and international bodies. Following a Mass, the Pope read the opening declaration. In the speech, he rejected the thoughts of "prophets of doom who are always forecasting disaster" in the world and in the future of the Church. Pope John stressed the pastoral, not doctrinal, nature of the Council: The Church did not need to repeat or reformulate existing doctrines and dogma but rather had to teach Christ's message in light of the modern world's ever-changing trends. He exhorted the Council Fathers "to use the medicine of mercy rather than the weapons of severity" in the documents they would produce. Gravissimum educationis is the Second Vatican Council's Declaration on Christian Education. It was promulgated on 28 October 1965 by Pope Paul VI, following approval by the assembled bishops by a vote of 2,290 to 35. 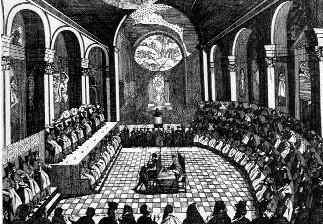 Orientalium Ecclesiarum is the Second Vatican Council's Decree on the Eastern Catholic Churches. One of the shortest conciliar documents, it was approved by a vote of 2,110 to 39 and promulgated by Pope Paul VI on November 21, 1964. "Orientalium Ecclesiarum" is Latin for "of [the] Eastern Churches," and is taken from the first line of the decree, as is customary with Roman Catholic official documents. The decree recognizes the right of Eastern Catholics to keep their own distinct liturgical practices while remaining in full communion with the Holy See. The decree exhorts Eastern Catholics to "take steps to return to their ancestral traditions." This aspect of the decree was directed against Latinisation.The document specifies some of the autonomous powers of the Eastern Churches. In particular, the Patriarch (or where applicable, major archbishop) and synod have the power to establish eparchies, to nominate bishops within their patriarchate, to legislate the rights and obligations of the minor orders (including subdiaconate), and to determine the date for celebrating Easter within their rite. It furthermore recognized the ancient practice in the East regarding the sacrament of confirmation (Chrismation), stating that all Eastern priests have the power to administer this sacrament using chrism blessed by a bishop. One of the implications of this is the further practice of infant communion was formally recognized. Presbyterorum ordinis, subtitled the "Decree on the Ministry and Life of Priests", is one of the documents produced by the Second Vatican Council. On 7 December 1965, the document was promulgated by Pope Paul VI, after an approval vote of 2,390 to 4 among the assembled bishops. The title means "Order of Priests" in Latin. As is customary for such documents in the Catholic Church, it is taken from the first line of the decree (its incipit). Gaudium et spes §4The phrase has continued to be used in papal encyclicals and the Catechism of the Catholic Church since then. St. Peter Claver Catholic parish is located in Punta Gorda, Toledo District, Belize. Wreckovation is a portmanteau term coined by some Catholics to describe the style of renovations which historic Catholic cathedrals, churches, and oratories have undergone since the Second Vatican Council (Vatican II) and which they oppose. As seen by these opponents, some post Vatican II renovations of older churches are similar in nature to the iconoclastic modifications of churches that took place in Northern Europe during the Reformation in the 16th Century or the Byzantine Iconoclasm in the 7th Century.